For tyranny to exist, sometimes you don't need one big despot like Hitler, when thousands of teeny little Hitlers are willing to be petty tyrants. Officials at Chicago's O'Hare airport told 17-year-old Jon Meier the chewed-on document was fine, but authorities in Miami rejected it and wouldn't let him board the southbound aircraft. His family's 1-year-old golden retriever, Sunshine, chewed a corner of the document, obscuring some numbers. And thus was Peru spared the terror of another high school Spanish student invading its borders. I feel so much safer with these sentinels of liberty patrolling our airports. "How will we pay for it?" We will pay for public sector health care coverage same way we do for private sector health care coverage: Those who can afford to pay will be billed for the expenses incurred by those who can't afford to pay. And the more expensive care will be rationed. The only difference will be that the government will collect the money and ration the care by force, as opposed to insurance companies performing those tasks on a more-or-less voluntary basis. Many people think this will be an improvement; they will be sorely disappointed. The only caveat I might add is that the new boss is almost inevitably worse than the old boss, especially in matters of government. "Quick! While the world is distracted by Michael Jackson ... pass that bill, raise that tax, strip those liberties — they won't notice until it's too late!" How many egregious laws will be traced to legislative action of June 26, 2009? I bet lots. As our rulers huddle behind closed doors, hammering out their plans to confiscate more of our money and set down more rules they expect us to follow, it's incumbent on us to remind ourselves that freedom is the default position of human beings. One of the most electrifying documents in human history asserts that it is "self-evident" — true beyond any reasonable doubt — that we are all "created equal ... endowed ... with certain unalienable rights, that among these are Life, Liberty, and the Pursuit of Happiness," and that governments derive their powers "from the consent of the governed." Governments do not grant freedom; they can only restrict the freedom we have from birth. 1. Pitchers should take their turn at bat. 2. The only time an American League team plays a National League team should be in the World Series. 3. Hank Aaron is the all-time home run king. Roger Maris is the single-season home run king. Records "earned" by mutants injected with bovine growth hormone should be expunged from the books. It's a small moment in a big picture, but I remember being thrilled and surprised at the point in To Kill A Mockingbird where Atticus Finch leaves for a couple of weeks for the annual meeting of the state assembly, of which he is a member. Two weeks out of fifty-two: Now that seems a reasonable amount of time for elected officials to gather and discuss how they will meddle in their constituents' lives. I am one of those increasingly rare persons who is paid to follow, report and comment on the news. So much of the news has become monitoring and reporting on the actions of the government. Now, I'm not saying that the government doesn't need monitoring, but I'm increasingly convinced that the most important news is usually not what the government is doing. In fact, the government is generally powerless to do anything beyond throwing a monkey wrench into the natural course of human activity. And so bodies like the state assembly gather regularly to assemble their monkey wrenches and determine where to throw them. What if the news gatherers looked for evidence of worthy human activity beyond the confines of the village hall or the state capitol? At some point they, and we, might reach the conclusion that the best of us happens despite the government and that, in fact, those who would run our lives are little more than a nuisance to progress. Love makes us do astonishing, amazing things. Things that surprise even us. Things that push us past what we thought were our limits. Things that are utterly, literally fantastic, i.e., things that exist only in the realm of fantasy. Love ties us together; it makes us understand ourselves and how much we need each other. With themes like that, Up qualifies as the most, er, uplifting story in many a year. It's the story of an old man, his absent late wife, a young boy, a dog and a bird — and what they're willing to do for love. It's hysterically funny, heartbreaking and heartwarming. It's made by the folks at Pixar, which has put out so many great stories that it must be considered the contemporary corporate home of master storytellers. Another home run into the next county. And I always try to remember the short at the beginning of the evening; the Pixar folks remember how much fun it was to have a cartoon with Road Runner, Bugs Bunny or even Pepe LePew before the main feature. Partly Cloudy is a sweetly creative turn on the old myth that storks deliver babies — it probably started with the question, OK, if storks deliver babies, where do they get the babies from? As always, the short warms up the audience with a healthy dose of bellylaughs and sentiment, softening us up for the story of Carl, Ellie, Russell, Dug and Kevin. Suddenly, when he least expected it, came a burst of beauty from the small patch of prairie flowers he planted last summer. 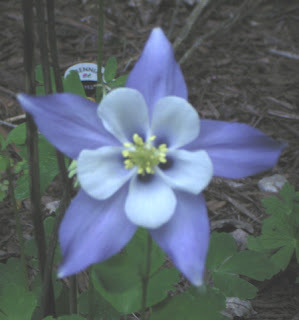 This little white flower inside the purple star is a columbine. Last fall he considered the columbine one of the season's small failures; now he realized that those August plantings had come after this particular flower's blooming season. WASHINGTON (AP) — In a defining moment for American capitalism, President Barack Obama ushered General Motors Corp. into bankruptcy protection Monday and put the government behind the wheel of the company that once symbolized the nation's economic muscle. The fallen giant, the largest U.S. industrial company ever to enter bankruptcy, is shedding some 21,000 jobs and 2,600 dealers. Sparing few communities, the retrenchment amounts to one-third of its U.S. work force and 40 percent of its dealerships. "A defining moment for American capitalism"? Under what definition of capitalism does the government own 60 percent of one of the largest corporations in the country? Don't worry, I know the answer; it's a rhetorical question. 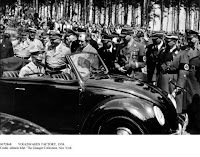 As Mr. Obama assumed the reins of General Motors and touted the smaller, more environmentally sound cars that the new GM will bring to the people, I couldn't help but recall the grainy film images of another powerful leader who coaxed automakers into producing the People's Car, or as they said in his language, the volkswagen. Maybe it's because I'm currently plowing through Milton Mayer's brilliant book, They Thought They Were Free. No, I'm not saying Mr. Obama is a 21st century version of Mr. Hitler. Yet.